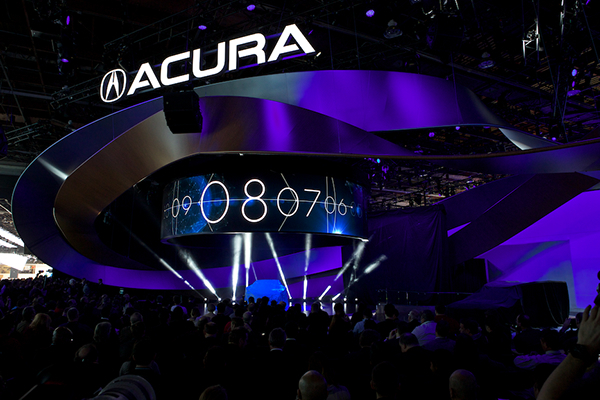 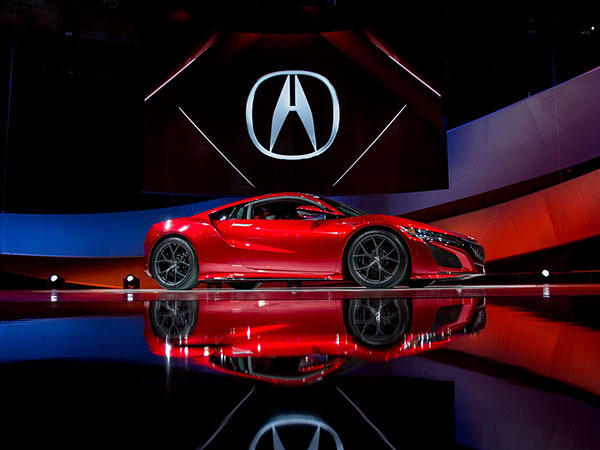 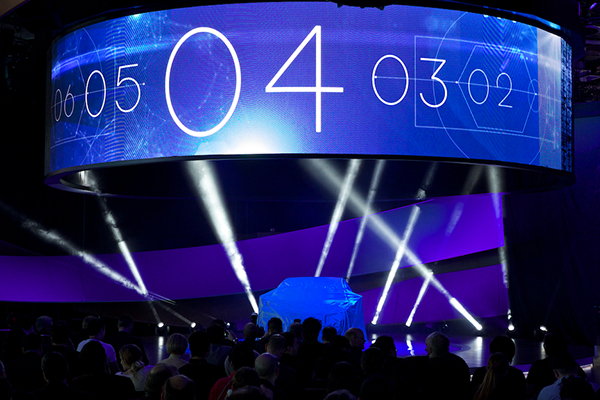 Detroit Auto Show 2015 Update for Acura NSX Super Car Reveal. 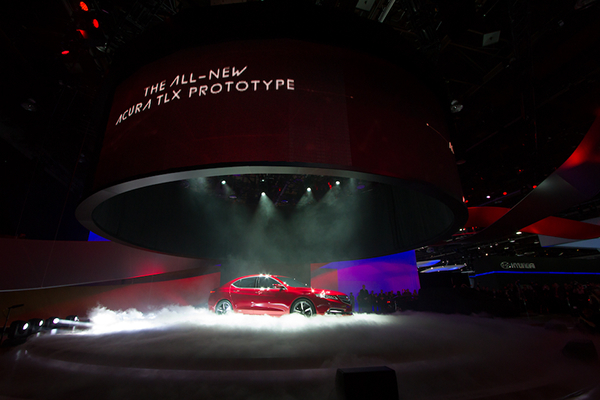 Photos from Acura Facebook. 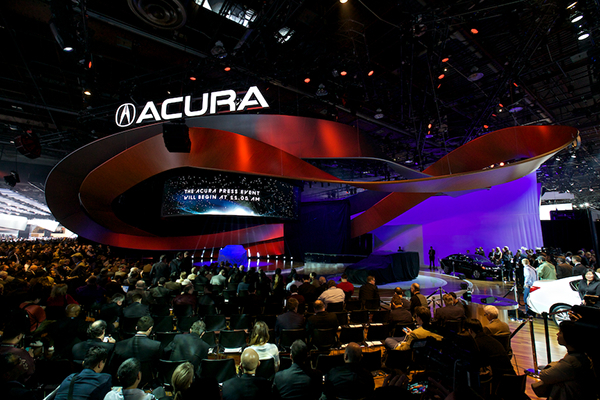 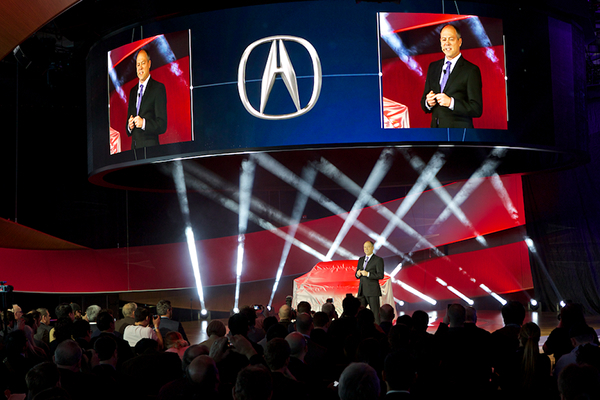 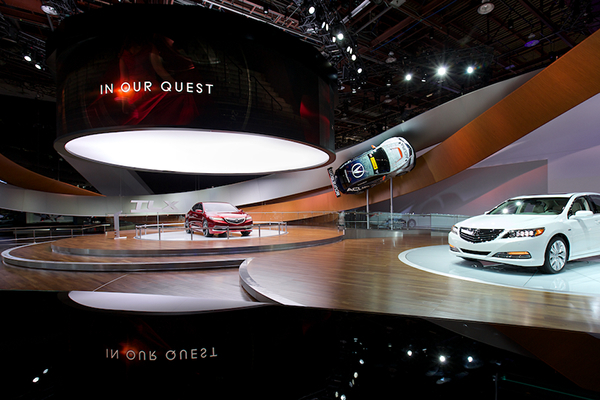 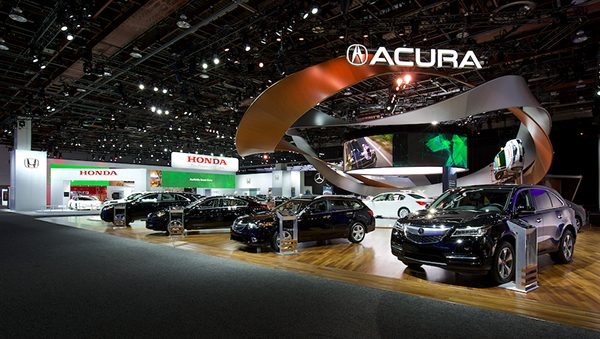 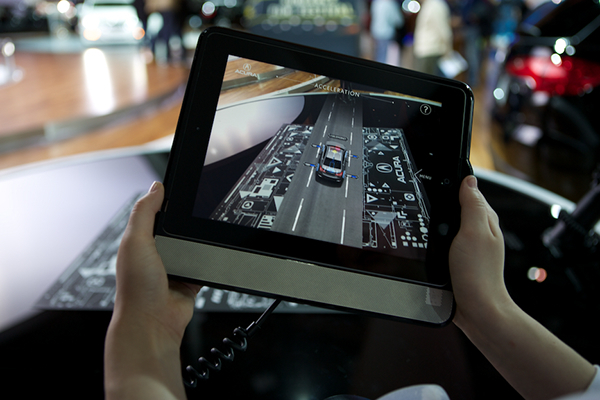 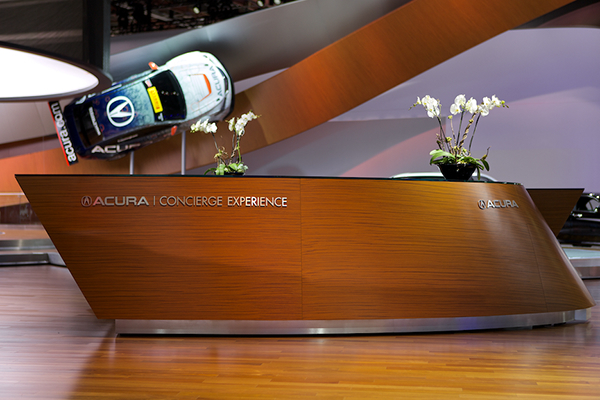 Our challenge was to create a Tier One, world class luxury motor show experience that would reflect Acura's "Man Machine Synergy" philosophy and also help bring more excitement and attention to the Acura brand at a highly competitive Detroit Auto Show event..
A holistic experience marketing campaign all inspired by MAN MACHINE SYNERGY from the brand architecture to the brand engagements and even down to the actual live press event held in the space. 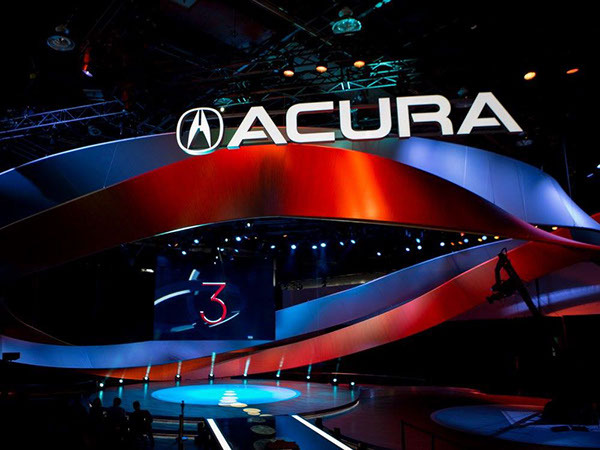 Inspired by Acura's performance / handling principle of INOMAMA or "At the will of the driver", the intial main iconic form of the brand architecture is a metaphor for a curvaceous race track or road that conforms or "bends" to the will of the driver. 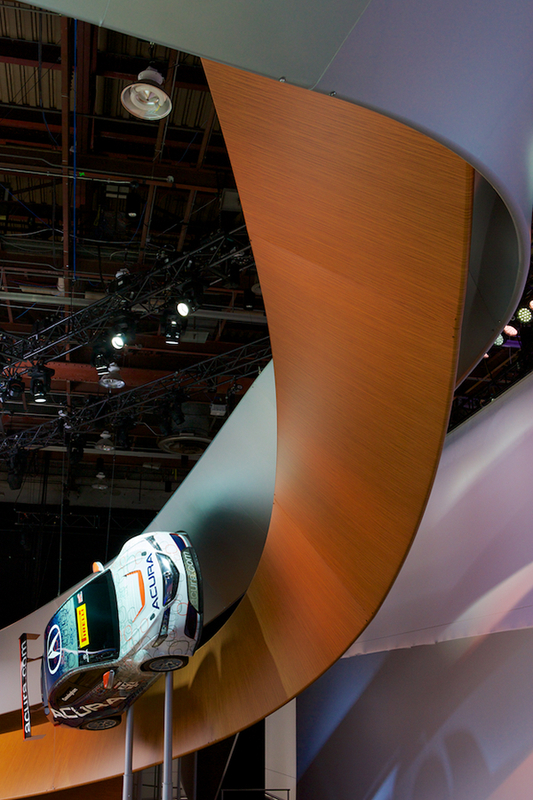 Note the gravity defying race car climbing up the ribbon and bending the road. 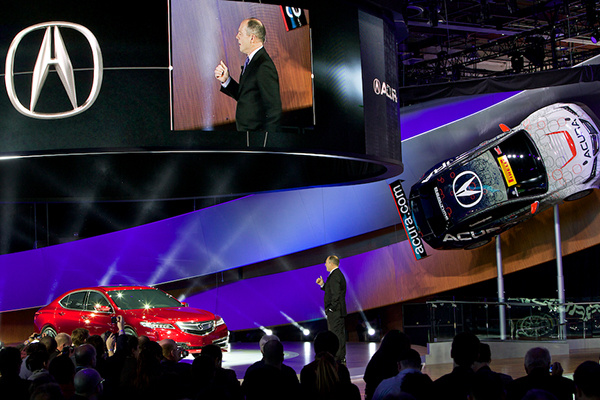 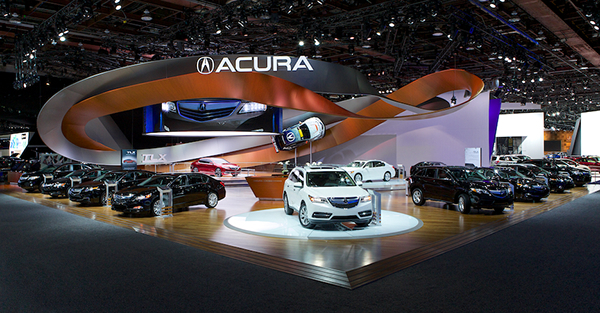 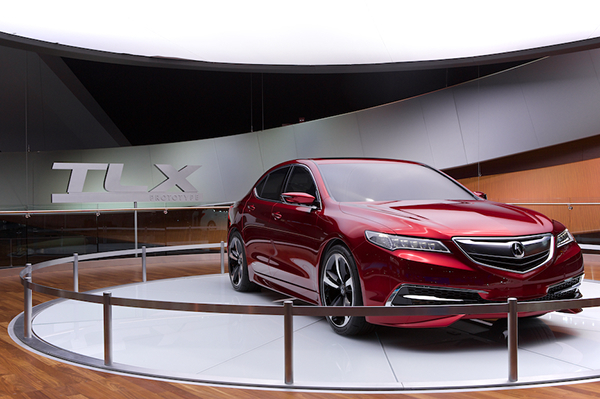 The entwined dual ribbon architecture also serves as a metaphor for Acura's main philosophy of "Man Machine Synergy." 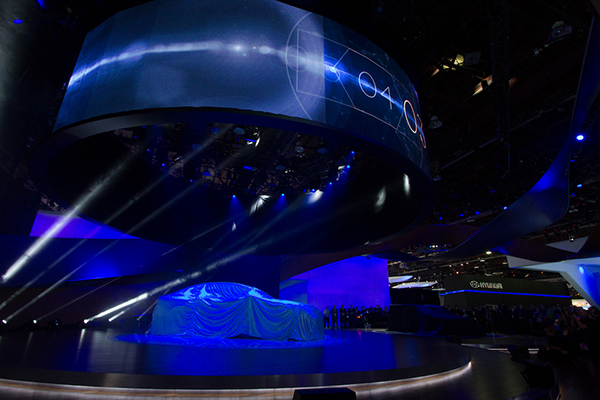 The natural wood ribbon represents "man" and the metal ribbon represents the "machine". 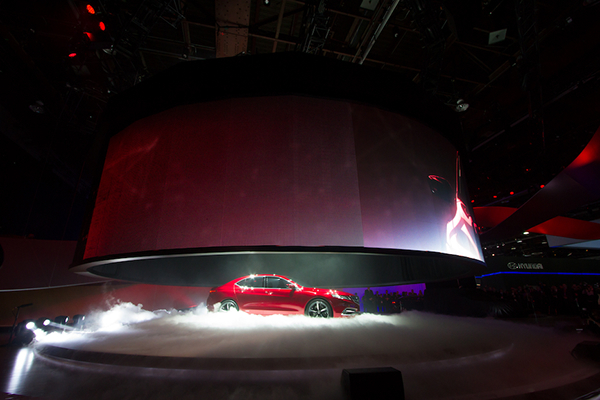 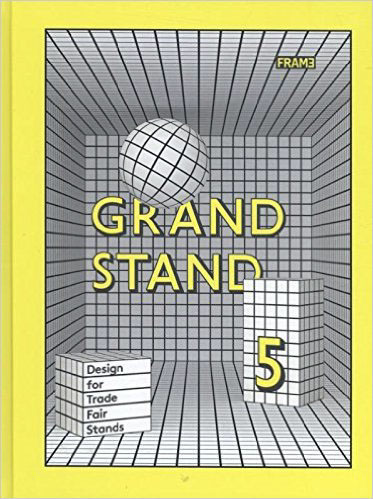 The super lightweight compound curved Ribbon architecture weighs in at a mere 3,000 lbs and is made of a high tech polymer film stretched over an aluminum frame. 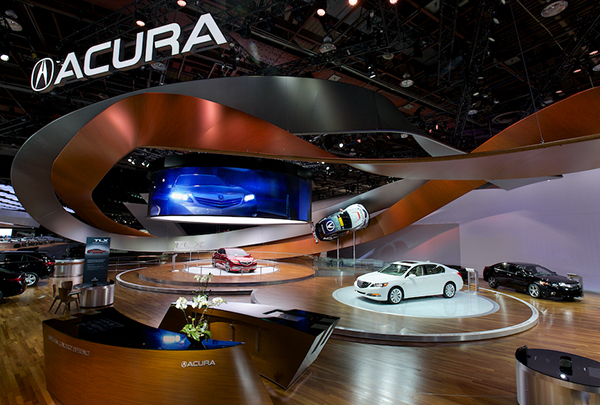 If the ribbons were to be constructed out of solid wood and metal frame structures, they would have weighed in over 50,000lbs! 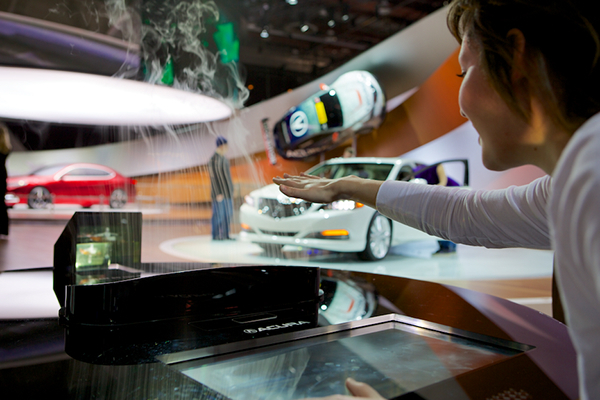 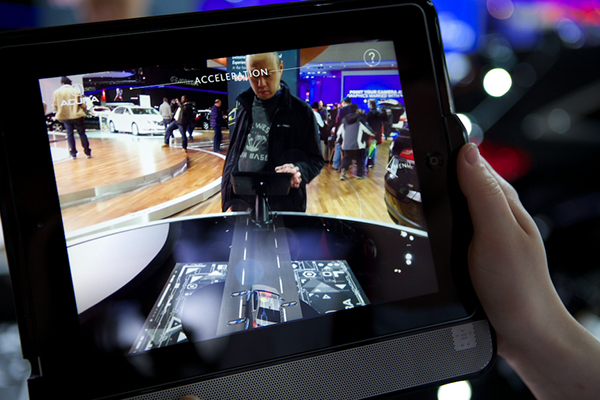 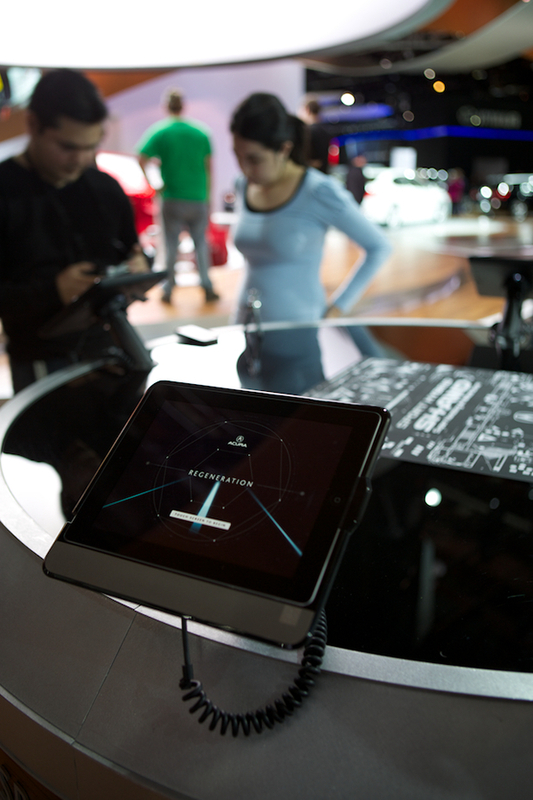 MAN MACHINE SYNERGY EXPERIENCE: True to the Acura "Man Machine Synergy" Philosophy, a holographic interactive unit was created to deliver Acura technology stories using synergistic hand gestural interface. 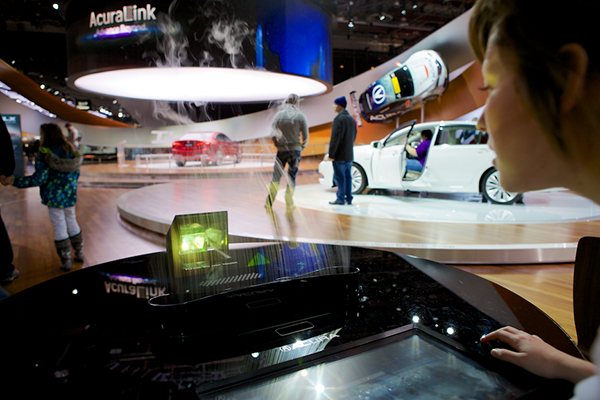 HOLOGRAPHIC MIST: An atomized water vapor screen is used to project content in a holographic manner. 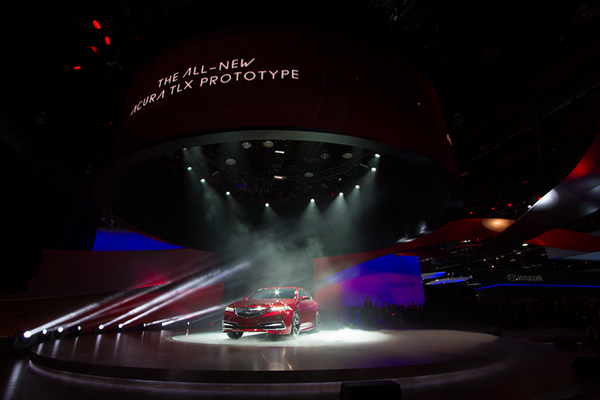 A photographer's Fischer style light box provides a beautiful even lighting glow across the Acura TLX Prototype vehicle and helps to accentuate its curves. 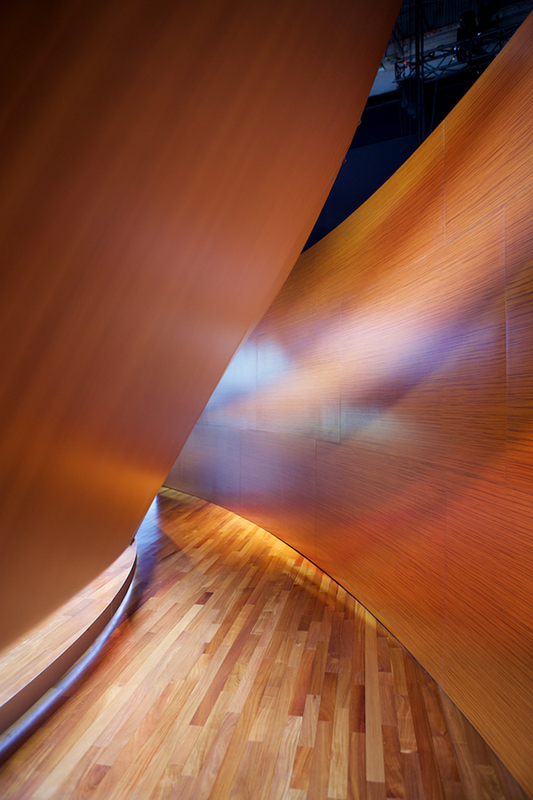 Ribbon architecture detail. 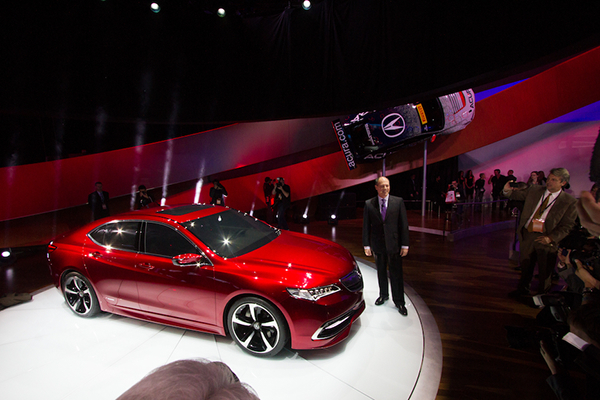 We wanted to suspend the car from the ceiling, but due to ceiling weight restrictions in certain venues, we ended up supporting the race car on steel posts. 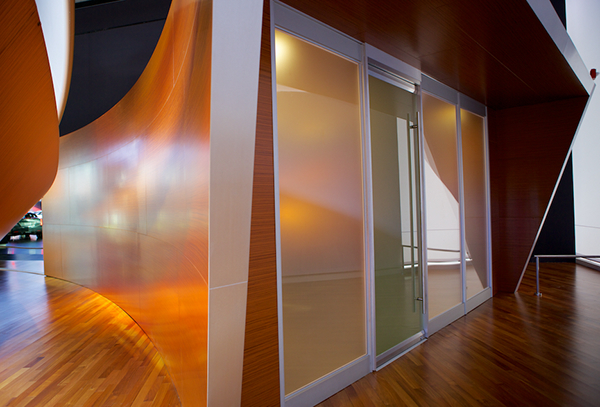 We were lucky that the ribbon architecture was only 3,000 lbs!